Usually, around this time time of year, I go on the road to help promote new editions of my guidebooks, and this year is no exception. Over the next month, I will be giving ten slide lectures to promote the new edition on Moon Handbooks Patagonia and, simultaneously, Moon Handbooks Buenos Aires (which includes excursions into the surrounding Pampas and coastal Uruguay). Attendees will be able to participate in a raffle for one free ticket to Santiago or Buenos Aires from any LAN Airlines gateway (New York, Miami, Los Angeles) in the U.S. or, presumably, Canada, as LAN has recently begun flights from Toronto to Santiago. Details are yet to be determined, but I will have more information soon and will explain them in person as well. Please also note that a few of these events are not yet up on their websites, but all of them are confirmed. Hope to see you there! Relatively few people have ever been to Easter Island - Rapa Nui to its indigenous Polynesian residents - but almost everybody knows something about it. Its enigmatic stone statues, made famous by Thor Heyerdahl (who asked big questions but got almost all the answers wrong), have become global icons. While the numbers who have seen them remain fairly small, tourism is growing every year as it gets easier to reach the island - in the middle of the Pacific Ocean, five hours from Santiago by jet - and the infrastructure mushrooms on a triangular land mass of only 171 square km (66 square miles), with a population of only about 4,000. If the Chilean government has its druthers, the number of visitors (50,000 last year) may increase dramatically. According to the online Santiago Times, summarizing the Spanish-language original article in the Santiago daily El Mercurio, private investors and government are dedicating US$17 million to modernize the hospital, improve the airport, increase flights, and build even more hotel rooms (the island has about 1,500 beds in accommodations that range from simple B&Bs to Explora's all inclusive Posada de Mike Rapu). This amounts to more than US$4,000 for every man, woman, and child. What's really startling is that an island that as recently as 2004 received only 24,000 visitors may get 200,000 by the year 2020. This could seriously stress natural resources - Rapa Nui has no potable surface water, for instance, and no easy options for solid waste disposal - on an island whose history has proven its vulnerability to environmental disruption. Last April, as I flew from Santiago back to California, the Chilean peso stood at roughly 430 pesos per dollar, as tourism operators, fruit exporters, wine producers and others moaned that that the strong currency was undercutting their export-oriented industries. Around that time, I noted, UCLA economist Sebastián Edwards was predicting that the overvalued peso would reach an equilibrium of about 535 to 545 per dollar, thanks in part to central bank purchases. In turns out that Edwards was almost spot on - even after the US financial bailout crisis caused a 13-peso drop from last Friday's rate, this morning's peso stood at exactly 535. Meanwhile, last week, Argentina's central bank had to sell off dollars to keep their peso from plunging against US currency, but the exchange rate has still fallen from 3.05 to 3.13 per dollar, even as the Buenos Aires Herald notes, in an editorial today, that "it is a supreme irony that so many people are flocking to buy dollars when they are the currency of crisis." In such a volatile international economic environment, it's hard to make any predictions but, given Argentina's inflation problems, about which I wrote in an earlier post, it's a good bet that Argentine prices will continue to rise - even though President Cristina Fernández de Kirchner appears to have finally acknowledged that a weak peso fuels inflation. For the moment, Chile seems to have gained some competitive advantage with its devaluation but, given Argentina's volatile economic history, anything could happen there. The question is whether, in the aftermath of the US financial meltdown, many travelers will feel able to take advantage of two countries that, by most standards, are still affordable destinations for the upcoming southern summer. Nearly two weeks ago, in the New York Times, there was a brief mention of northwestern Argentina, an area that gets plenty of European visitors but relatively few North Americans - despite its remarkable resemblance to the Four Corners area of Colorado, Utah, Arizona and New Mexico. The author of the article actually consults with Ian Mount, a U.S. journalist who writes the excellent Buenos Aires blog Good Airs. Ian, whom I've never met though he lives only a few blocks from me in Buenos Aires - somehow our schedules have never meshed - has some good suggestions including a visit to Estancia Colomé (pictured here) near the town of Molinos, in Salta province. If staying at Colomé is beyond your budget, it's still worth a detour to sample their outstanding wines. Ian also mentions, as I would, that travel in this region is far more reliable by overnight buses than by air, as Aerolíneas Argentinas is still going through an awkward transition to state ownership. Flights are few to the northwest, so if you miss you'll likely have to wait an entire day for the next. The other day, without concrete information, I speculated that the northernmost stretch of the Carretera Austral, from Chaitén south perhaps to the Futaleuf´turnoff, might be closed for upcoming season after the massive ashfall on Chaitén. This would have necessitated long detours through Argentina or a ferry to Puerto Chacabuco for travelers on the Carretera Austral, but a reader from Punta Arenas has informed me that ferries are presently operating from Puerto Montt to Chaitén. I had tried to verify this with Naviera Austral by phone, but was unable to contact them until today, when they informed me that ferries are sailing Tuesday, Thursday and Friday from Puerto Montt. That does not mean, however, that travelers will be able to stay in Chaitén, which is still under tons of ash (as pictured here). Motorists will have to continue immediately and carry enough fuel to reach the town of La Junta, about 150 km (90 miles) south (where the next gas station is). According to my Punta Arenas reader, cyclists and pedestrians will not be permitted on the ferry, but the Naviera Austral office told me they would be. In any event, it looks as if disruptions along the highway will be minimal for the upcoming season. Last February, I wrote about the shifting of Buenos Aires's Festival de Tango to August, creating a "tango month" if you will, with the Mundial de Tango (World Tango Championships) following almost immediately. I wasn't able to go to Buenos Aires this month, but my friend Patricia Thaxter, who lives in BA and brings tango enthusiasts to the city through her Infusions Travel, has sent me a short report from which I will quote liberally. According to Patricia, Sunday (August 31) "was the last day of the Campeonato; this year they had the two events back to back and at the same place...the exhibits and most activities were at Harrod's, the old department store building on Florida. It was actually a very nice venue, with wooden dance floors. All events there were free. Ariana and I got there just in time to watch an old 40´s movie (b&w) called El Tango Vuelve a Paris, with a famous singer, Rinaldi, and a famous bandoneon player, Anibal Troilo, who later formed his own, very famous tango orchestra. One of our friends who had a booth there said more people attended the festival week than the campeonato week. When we got there about 3pm it wasn´t crowded at all, but by 7pm when we came out of the movie, the place was packed!! There was tango dancing everywhere, in every spot where there was a wooden floor, and then a tango orchestra began playing and they had two couples dancing, the campeonato winners of tango salon of last year and then the ones that won this year! It was too crowded however to properly watch, so I only caught a few glimpses." Patricia is mistaken about the tango singer, as an Argentine movie data base I consulted shows him to be Alberto Castillo (1914-2002). She is correct about Troilo, however. Personally, I have been to the Festival de Tango several times and enjoy the diversity of both its participatory and spectator events. It's always struck me as odd, though, to have tango championships - as if they were like a soccer match, even if we acknowledge that some dancers are better than others. In my opinion, the festival should move back to February - when outdoor events are much easier to stage - to spread the tango wealth around the year. I like seeing performers like the casual street orchestra La Furca (pictured above). Flying to Santiago - and Onward? We have a winner in the giveaway for the two LAN tickets to Santiago in September, but I had been slow to post it because the original quiz winner was unable to fit his schedule to the limited time frame we had. The runner-up was Gabriel Brammer, an astronomy student presently in Santiago, who is using the tickets to fly his father and uncle to Chile. I will be holding more quizzes in the future, but there's no guarantee I'll be able to offer such a generous prize very often - more than likely it'll be one of my guidebooks. Many Chileans, meanwhile, may be spending their September patriotic holidays on the other side of the Andes. In today's El Mercurio, Buenos Aires-based Chilean journalist Juan Carlos Meneses offers a guide on what to see and do in BA over the four-day Chilean weekend - and suggests that this new tradition, dating from Argentina's 2001 collapse, "is not antipatriotic." For more on the topic of Chileans spending their holidays in Argentina, see my earlier post on the border city of Mendoza. Tango, theater, soccer, and cinema are all among the highlights, but it's a safe bet that many Chileans - notorious power shoppers - will spend much of their time malls like the recycled Galerías Pacífico. Here, at least, they'll be able to absorb some culture with their shopping, through the landmark murals that cover its central cupola (pictured here). According to the international consultancy group Mercer, as quoted in Mercopress Noticias, Buenos Aires is getting more expensive for foreigners. That's no surprise - anyone who's spent any time in town the last couple years can tell you that hotels, restaurants, taxis, fuel prices, and other services are all rising rapidly. 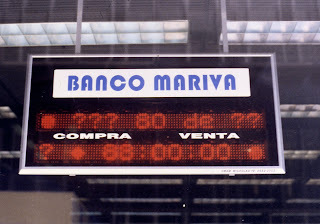 What's surprising is that Mercer, whose annual cost of living survey for expatriates around the world appears only in part on their website, says that Buenos Aires still ranks 138th out of 143 cities worldwide, making it nearly the cheapest major city in the world (Asunción, in neighboring Paraguay, is the cheapest). The most expensive is Moscow, and São Paulo (25th) is the most expensive in South America. According to Mercer, the weak dollar partially accounts for increasing costs, but the dollar has been holding its own against the Argentine currency, at just over three pesos per dollar. In reality, domestic inflation that most independent economists calculate around 20 percent (as opposed to government statistics that insist on six or seven percent) is the major factor here. And that makes it hard to believe that Buenos Aires - despite Mercer's assertions - ranks where it does. Having spent extended periods in both Santiago (Chile) and Montevideo (Uruguay) earlier this year, I find it implausible that either of those cities is significantly more expensive than Buenos Aires.